Designed by nature and a fortunate survivor of man’s intent to ‘improve’ it, the Exmoor pony is grazing for conservation in selected areas of the UK. This is a good arrangement for both; as Exmoor ponies are themselves an endangered breed. A significant number of Exmoor bloodlines, previously isolated for hundreds, if not thousands of years, became diluted by the deliberate introduction of other breeds. This dilution of the very characteristics that had enabled the ponies to survive the extreme conditions in which they lived weakened their natural defences and the crossbred ponies died out. The zoological importance of this breed has since been recognised, and the need for its conservation better understood. Away from Exmoor, the number of ponies has increased, but there are still less than two hundred living wild there.In its new role as a conservation tool the Exmoor pony is invaluable. Primitive in design (similar to Przewalski’s Horse) with a characteristic ‘mealy muzzle’ and eye ring, together with a double layered coat, that not only equips it with camouflage amongst the mixed heather, grass and bracken of its natural habitat, but also provides a warm and waterproof defence against severe wet and cold, this breed evolved to survive. The unique bone structure of today’s Exmoor ponies compares almost identically to fossils of Britain’s wild ponies of 130,000 years ago. Since WWII, government pressures on the farming industry, road and urban development, as well as changes in traditional grazing methods and the resultant invasion of tor grass (Brachypodium pinatum) scrub and bracken, have led to the loss of huge areas of chalk grassland and open lowland heath. Tor grass is invasive and smothering, its growth suppresses the important species needed to maintain the classic landscape and endemic wildlife of such areas. This is where the Exmoor further proves its usefulness. The ability to thrive on low-nutrientgrassland, often regarded as useless for other grazing stock, is one of the ponies major advantages. Two herds owned by the charity, Sussex Pony Grazing & Conservation Trust, have already made a visible difference to the unique landscapes and biodiversity value of both the South Downs and Ashdown Forest. Ancient chalk grasslands can contain 56 different species of flowers and grasses per square metre. Cowslips, the nationally rare early spider and burnt-tip orchids, and round-headed rampions are among the flowers making a comeback. Brown hares are one of the larger mammals to benefit. Adonis blue, chalkhill blue and silver-spotted skipper butterflies are also growing in numbers as a result of the efficient cyclical grazing of Exmoor ponies. Ashdown Forest, a Special Protection Area (SPA) has, amongst the birds mentioned within the SPA citation, nightjar, Dartford warbler and woodlark. Wet and dry heath communities also make Ashdown Forest a candidate Special Area of Conservation (cSAC).The Sussex Pony & Grazing Conservation Trust was set up in August 2004 and owns two herds of Exmoor ponies. The Trust works with local farmers and landowners to accomplish a forward-looking grazing plan. It also has the enthusiastic backing of DEFRA and English Nature and keen support groups of local volunteers-including those from the South Downs Volunteer Rangers-who check the ponies daily, with professional input from the Trust’s veterinary surgeon. A recent advertisement, placed with ‘environmental jobs uk’ for volunteer herdsmen and women to help when rounding up the ponies prior to relocating, resulted in responses from all over the UK, and even one from Poland! I have been on one of these round-ups and they’re not for the faint hearted! Even though I have an equestrian background and lived in Africa, the sheer power and momentum of this particular wild herd of Thelwell-look-alikes thundering close by in my native Sussex was an experience I’ll never forget! So what future for these hairy, hoofed, heroes? 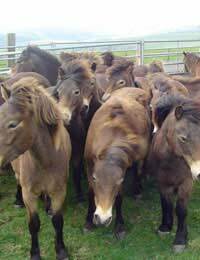 The Exmoor pony has strong national and international support; but its future is by no means secure. Exmoor Ponies in Conservation (EPIC) the National Trust and government agencies work closely together to assist the free-living herds that graze areas such as: the Lizard in Cornwall, Purbecks in Dorset, Silverdale in Lancashire and more than five hundred acres of woodland pasture in Buckinghamshire. For the small, hardy, survivor of sabre-toothed tigers and ice ages that previously threatened their existence, the tough little ponies have themselves become pioneer settlers and conservationists. For the numerous other threatened species, helped by the continued presence of the Exmoor pony, survival is where the grass is. Further information: guidestar.org. The official website of all charities registered with the Charity Commission.There is also a website called exmoorpony.org.